Adventures in Spain at a geothermal tile factory! I skipped last week’s post because I was in Spain visiting the tile company Porcelanosa’s geothermal-powered factory and international showrooms in Villarreal (near Valencia)! More on that later, but I’ll just say for now that when I walked onto their campus, I felt like I did when I first saw the Star Wars movie at age 10—with wide-eyed wonder and intense curiosity. During my time there, my senses were submerged in an array of textures, colors and materials on an epic scale of awesome. You, like me, might think of tile manufacturing as this gross dirty wasteful process and it certainly can be. I think I could have eaten off the floor of the Porcelanosa factory! I’m not kidding when I say it was that clean. I was amazed at how eco-conscious their whole process is from start to finish. They showed me an on-site wastewater treatment plan where they clean wastewater so it can be used again and again in the plant. They even have a way of reclaiming the excess heat from the massive kiln where the tiles are fired and using that heat to run a turbine that generates electricity for the lights and other systems in the factory. The showrooms were design geek heaven. Showroom after showroom of design vignettes showcasing Porcelanosa’s tiles, countertops, flooring, kitchen cabinets, bathroom materials, and other products I instantly imagined in your healthcare space. 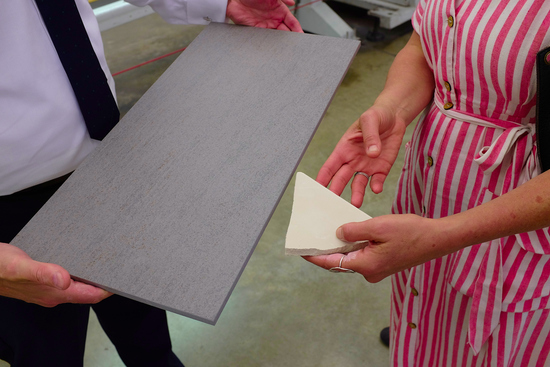 Here’s a quick pic of me and National Sales Director Andy Pennington examining two tiles–a fragment that QA rejected before the kiln process and a beautifully finished one still warm from the kiln. 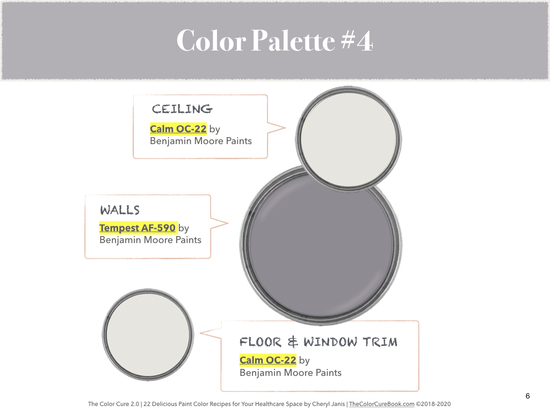 Speaking of design inspiration, today I wanted to share with you one of my favorite color palettes from my twenty-five page booklet, “22 Delicious Paint Color Recipes For Your Healthcare And Wellness Space Plus 3 Bonus Colors”, available when you purchase The Complete Bundle of The Color Cure 2.0. 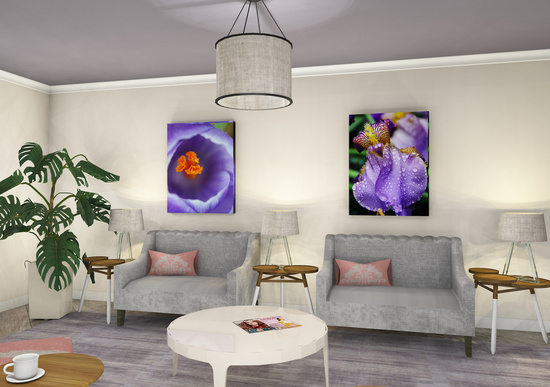 The gorgeous artwork is by one of my favorite art-for-healthcare artists Peter C. Blanchard. Check out his photography and art here: https://manifestphoto.com/art/art-for-healthcare/ and get 10% off any of his art simply by mentioning my name. Next week I’ll share more of my adventures in Spain and what’s new in healthcare design. I know you’re going to love it.